Drinar Varyon is a Dunmer smuggler working for Odral Helvi in Ald'ruhn. He deals in raw ebony and Dwemer artifacts under the guise of a man studying native pottery. He is wearing a common shirt with matching pants, shoes, ring and amulet. He is also carrying the key to his house and 13 gold. Aside from his natural resistance to fire and the sanctuary provided by his ancestors, he knows no spells. Greeting: "I am Drinar Varyon of the famous Varyon family." Drinar Varyon: "The one and only." my trade: "I am studying native Dunmer pottery. Please do not waste any more of my time." Varyon family: "Surely even a foreigner has heard of the Varyon family. no? Then I do not want to waste my time educating you. I am only here to study local pottery techniques." Drinar claims to come from a well-known family, though the only other Varyon seen or mentioned in any game is an inconsequential bandit by the name of Dovrosi Varyon who lives in the cave of Shurinbaal. Members of the Thieves Guild in Ald'ruhn will tell you that the two are brother and sister, and asking Drinar about her causes his disposition to drop twenty points. 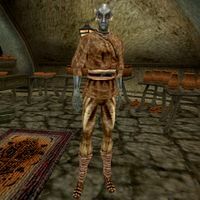 After completing the Shipment of Ebony quest for House Hlaalu, and turned in the ebony to Segunivus Mantedius, Drinar will disappear from Morrowind. If you kill Drinar before beginning the House Hlaalu quest Shipment of Ebony, Odral Helvi will only say that he needs to find a new fence, effectively making it impossible to complete the House Hlaalu questline. On PC, this can be fixed using console commands. This page was last modified on 19 October 2017, at 13:01.